This five-mile hike is demanding, thrilling and beautiful! It has everything from ladders and cables to amazing views of the Watauga Valley and the Blue Ridge Parkway. 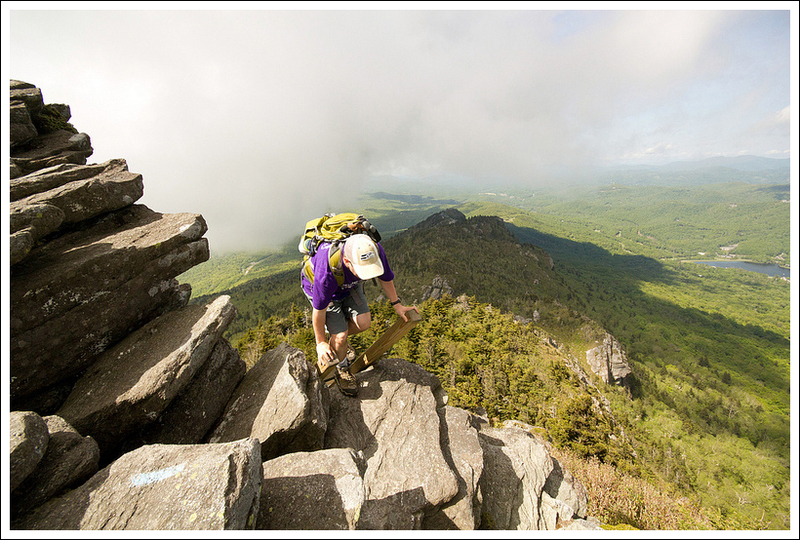 If you’re a fit hiker looking for something a little different – Grandfather Mountain definitely fits the bill! Sand Myrtle crowns Attic Window Peak on Grandfather Mountain, making the view all the more lovely. You can see the ‘Sugar Cube’ sitting on the mountain top off in the distance. 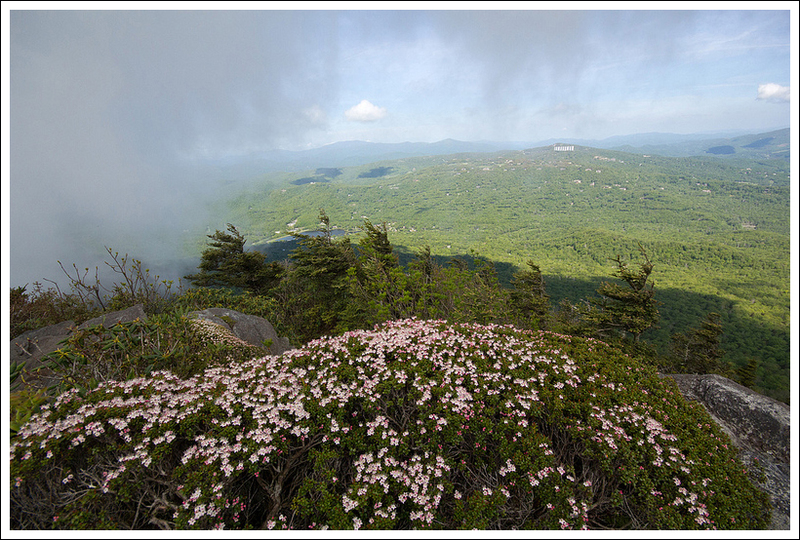 Below: Hiker parking on Grandfather Mountain; A view looking back on the Mile High Swinging Bridge; Native pink azaleas. 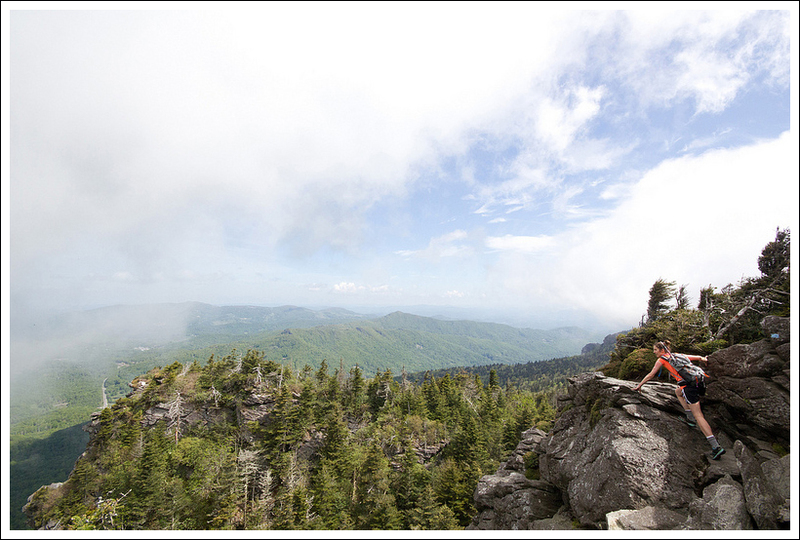 We have a love-hate relationship with Grandfather Mountain. I definitely enjoy the hike more than Christine, but both times we have hiked it, things haven’t gone as great as planned. 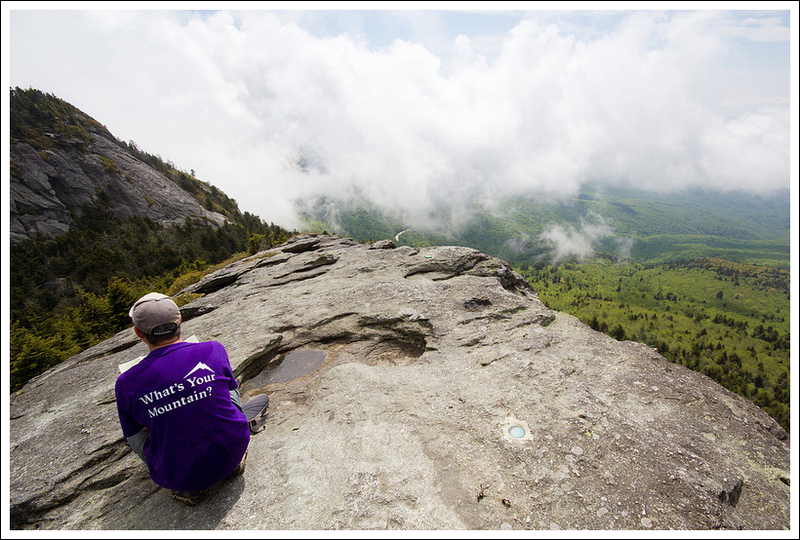 The views on Grandfather Mountain are amazing, but some of the physical and mental challenges definitely take their toll. 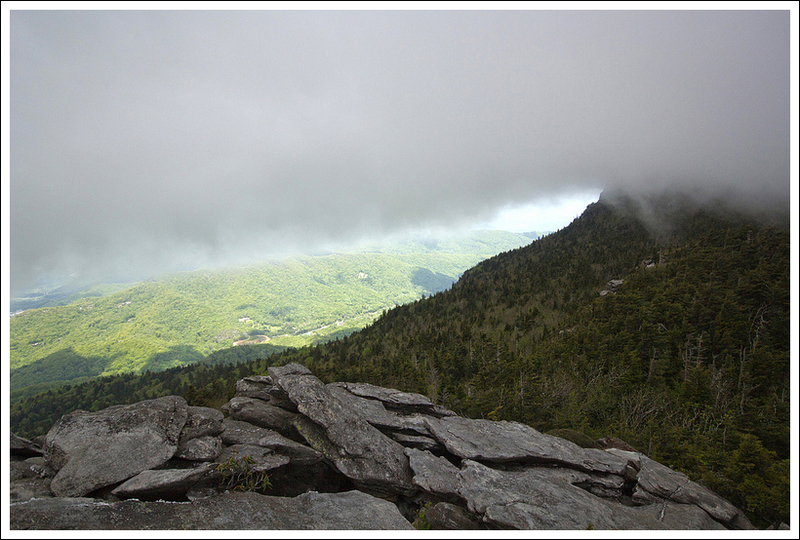 The last time we hiked up Grandfather Mountain, we only made it a little past Attic Window peak. Christine wasn’t feeling well that day, so we decided we make a second attempt on this trip and make it to the highest peak, Calloway Peak. We were some of the first people on the trail that day. The lady at the entrance gate (it costs $18 per adult) gave us a parking sign to put in our car window. This is used in case someone goes missing on the mountain and they need to perform a rescue. We were told they wanted us back at our car by an hour before closing. We parked in the lower Trails Parking area and were the first car in the parking lot. We quickly set off on to the Bridge Trail, which winds through a series of switchbacks, crossing underneath the Mile High Swinging Bridge, before reaching the upper parking lot at .4 miles. We made a quick trip into the gift shop and then took a quick trip across the Mile High Swinging Bridge. The wind was quite calm this time on the trail; last time, the bridge was singing and the wind was so strong, Christine could barely walk across the parking lot. I have a big fear of heights when it comes to man-made things (roller coasters, ziplines, ladders, etc. ), so the swinging bridge is always a gut-check for me. The fact that the wind was calm made it easier for me. We walked on to the rocks on the other side and enjoyed some spectacular morning views to the west. Crossing back across the bridge, we made our way down the stairs and across the parking lot to the large wooden sign to begin our real hike on the Grandfather Trail. We climbed up a few stairs and started our hike on the blue-blazed trail. The first part of the trail isn’t too tough. You reach an open area called The Patio at .6 miles and at .7 miles you reach the junction with the Grandfather Extension Trail. 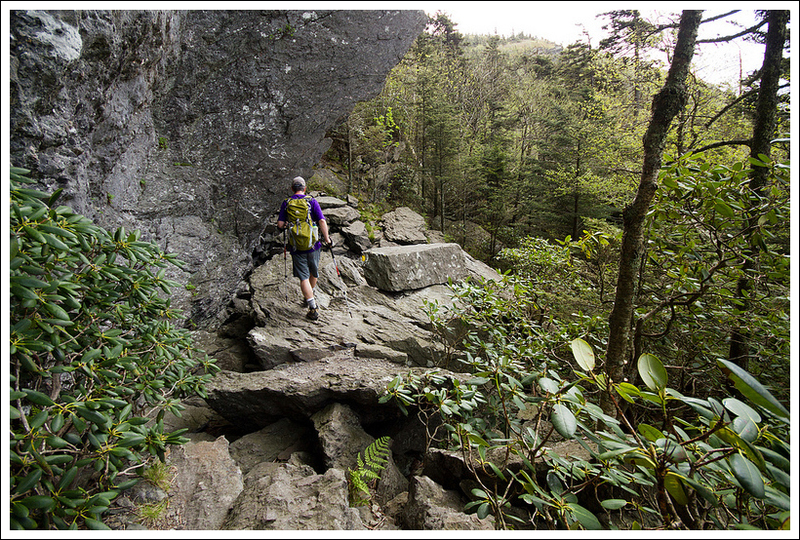 Continue past this trail and at .8 miles, you will pass the scenic Grandfather Gap area. Just ahead is a junction where the Underwood Trail branches off at .9 miles. 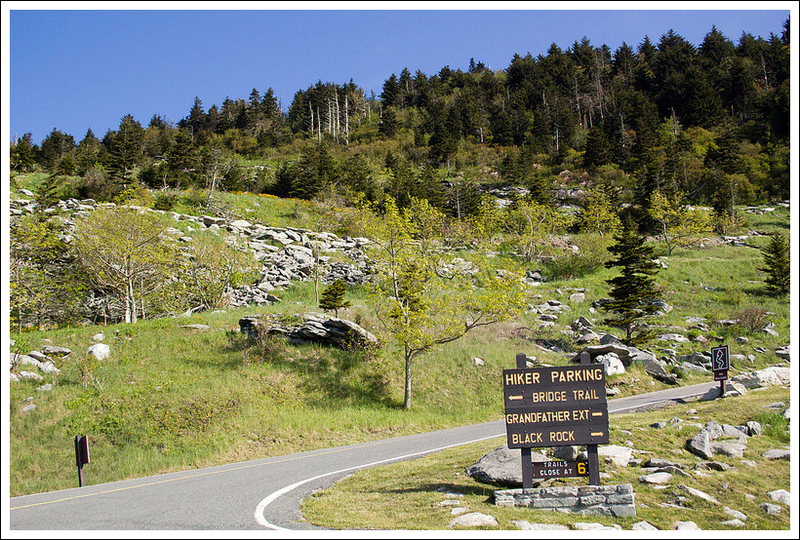 We continued on the Grandfather Trail and here is where it can be challenging. Your first introduction to the difficulty of the hike is when you come across some cables that are helpful to grab onto to help yourself climb up or down the trail. 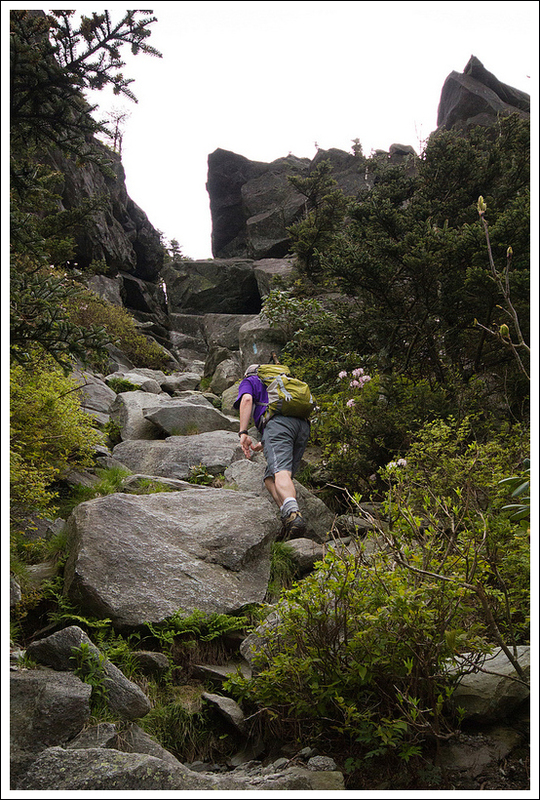 When it is wet, the rocks can be steep and slippery, so it is helpful and often necessary to grab onto these. 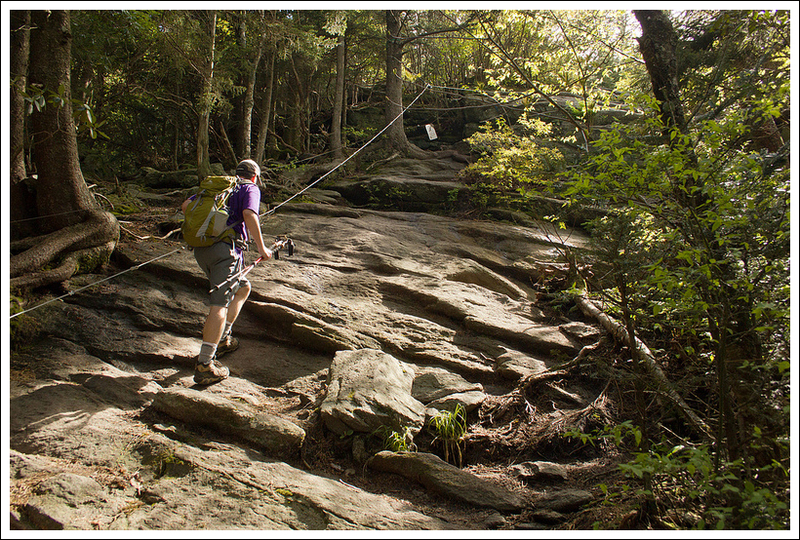 Adam uses cables to assist him across a steep, slick rock. Below: Adam enjoys the views; Christine hiking along the easy part of the Grandfather Trail; Climbing one of the first ladders en route to MacRae Peak. 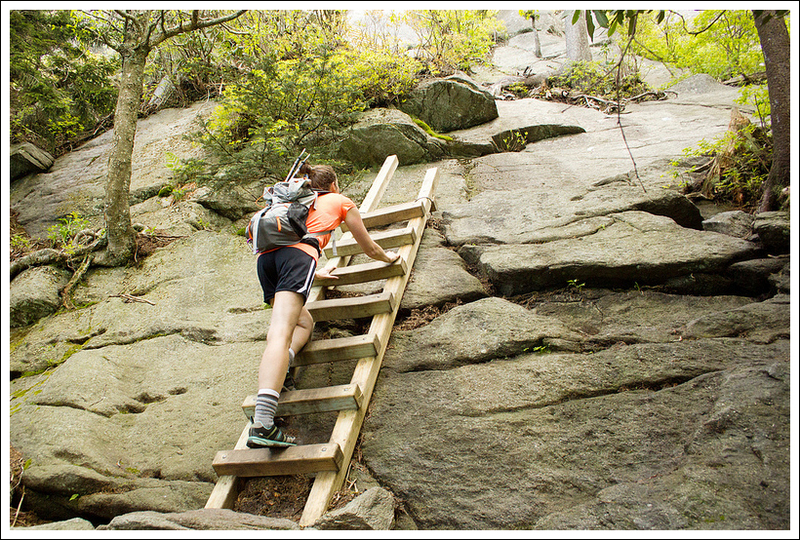 In a short distance as you are making way toward MacRae Peak, you have to navigate a series of ladders. The first one starts off as you squeeze along a rock that will have you hunched over and you climb up a tall ladder that is at an angle along a large rock face. This climb wasn’t as scary, but it is just a taste of what is to come. If you’re feeling uncomfortable climbing this ladder, I would recommend turning around. After climbing this first ladder, you will come upon more series of ladders. Some of these go directly up the cliff side and you are looking at huge drop-offs on the side. The first time I was definitely scared going up, but I felt more comfortable on this climb. The ladders are bolted into the rock and the ladders are placed at just enough angle that I didn’t feel I was going to plummet to my death. Once you navigate up through the ladders and climb up where it begins to level off, you are rewarded with more amazing views around you. We continued further and reached the sign to MacRae Peak at 1.3 miles. The sign rests at the bottom of another ladder. Climbing up to the top of the ladder, you then need to grab a cable to help pull yourself up to the summit boulder of MacRae Peak. The 360-degree views at this point are stunning on a clear day. We took a short break at the top and then made our way back down the ladder to continue our hike. The trail begins to climb down and at 1.4 miles, you see another junction with the Underwood Trail. 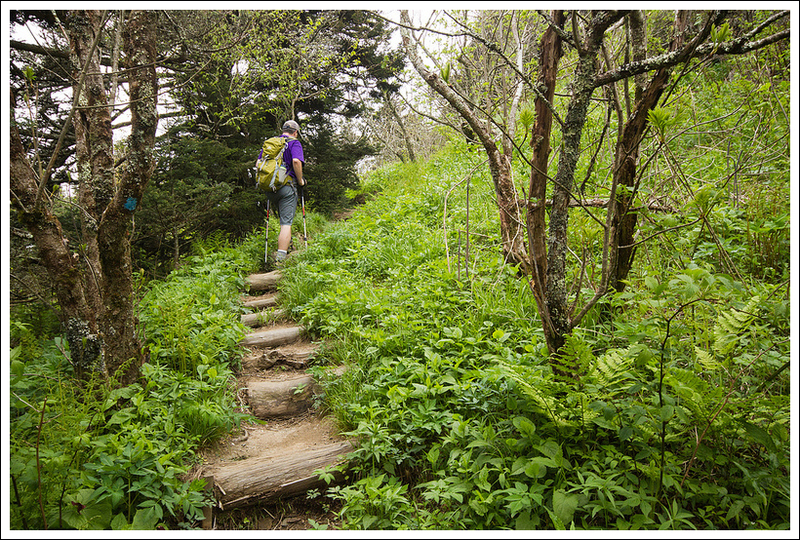 Continue the Grandfather Trail downhill with some big steps and cables. The trail then begins to climb again up to the Attic Window. You navigate through an area called The Chute, which has you climbing up a short but very steep area of small boulders to make your way to the top. 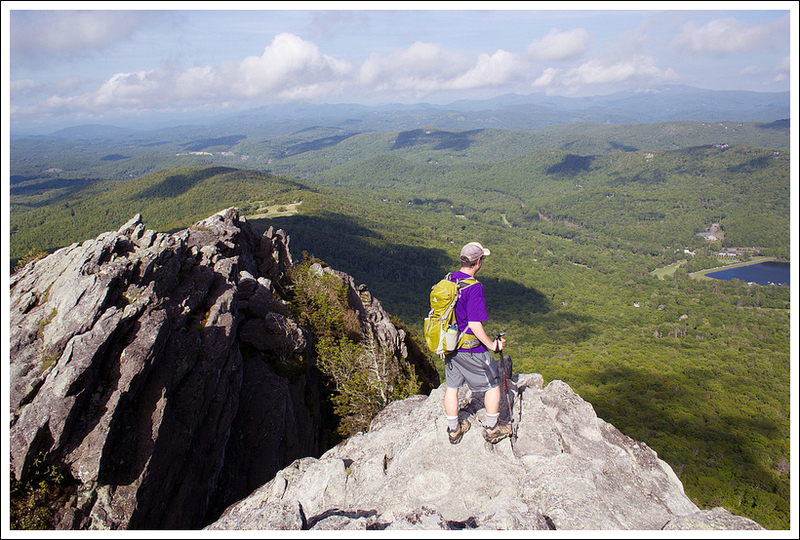 As you crest the top at 1.6 miles, you can wind around to a rock outcropping known as Attic Window Peak, which serves as a great viewpoint. We had spotted someone sitting at the top of Attic Window Peak from MacRae peak. He was still there when we arrived and I noticed he was taking in the views while reading The Great Gatsby by F. Scott Fitzgerald. He was asking if any of the other views were worth the trip, since he came up via the Profile Trail. He was interested in seeing the Mile High Swinging Bridge, but when we saw him later on the trail, we learned that he decided to just go back the way he came. Christine climbs the rocks. Below: Adam on a set of multiple ladders, Coming off the top of the ladder onto exposed cliffside; A well-earned view! From Attic Window Peak, the trail goes downhill again, but then passes through a level area as you walk along a ridgeline with some great northwestern views (and a view of the steep Profile Trail). 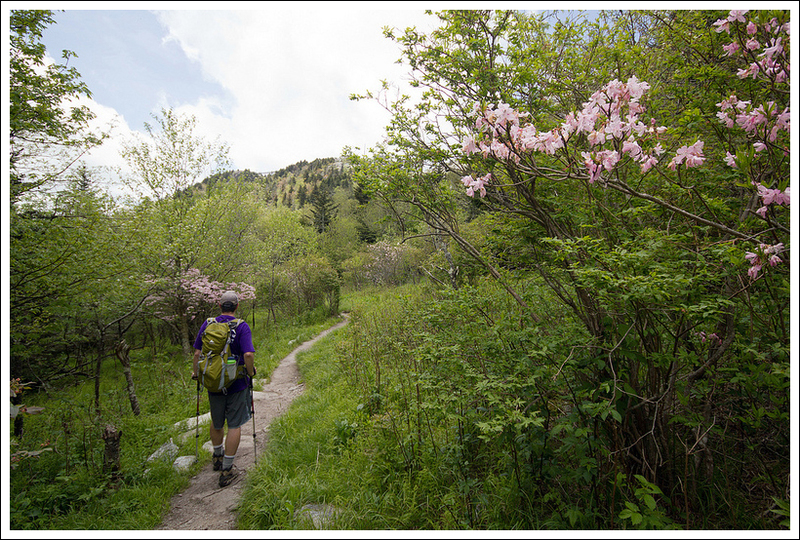 At 1.9 miles, you reach another overnight camping area known as Alpine Meadow. The trail descends again down another gap, before making the way up to Calloway Peak. At this point, the clouds were rolling in and sticking to the mountain, so our visibility was going away fast. We climbed up the Calloway Gap area and reached the junction with the Profile Trail at 2.3 miles. We pressed on, passing by the Cliffside Campsite at 2.4 miles. The trail continued to climb up some switchbacks. A sign came up at 2.7 miles which pointed the way to the Watauga View. 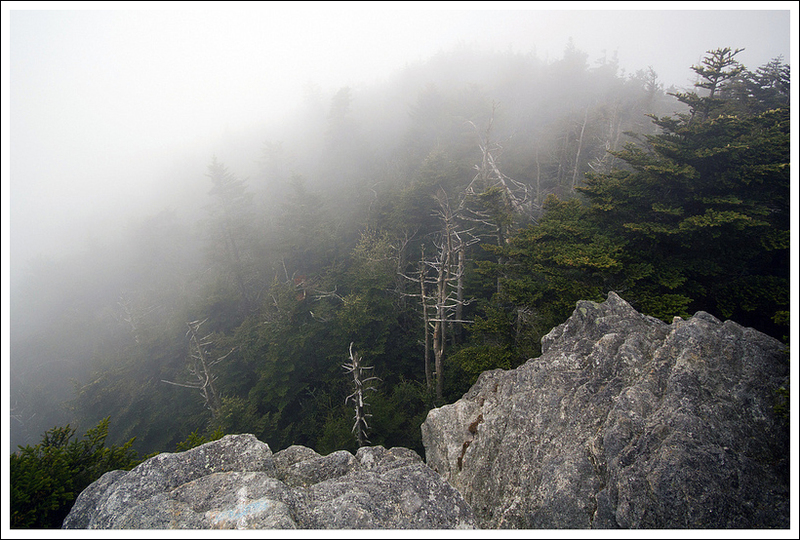 Knowing there wasn’t much a view as we hiked in the fog, we made our way to the Calloway Peak. The trail at this point climbed up a couple of more technical ladders. We reached a rock that was the Calloway Peak at 2.8 miles. There was no sign designating this as the peak, but from ground markings, we could tell this is where the white-blazed trail of the Daniel Boone Scout Trail met the blue-blazed Grandfather Trail. I’m sure there is a view from the rocks here, but we could barely see 10 feet in front of our face. Disappointed, we made our way back down the ladders and took the side trail to the Watauga View. The view was barely there, but we stayed long enough to eat our packed lunch before making our way back. The views on the way back were getting swallowed by the clouds settling on the mountain, so we lost a lot of the views on the way back. At 3.7 miles, we reached the junction with the yellow-blazed Underwood Trail. We decided to take that trail back to avoid some of the ladders. This trail is incredibly rocky and my knees were in so much pain after a short distance on this trail. I think if we do this trail again, I would rather take the ladders than this hellish, downhill knee-destroyer. Every step, I felt shooting pain in one of my knees and I wondered if I would need to be rescued (at least there was a sign in our car). We navigated down one large ladder and finally reached the junction with the Grandfather Trail again at 4.2 miles. I turned around to flip the bird to the trail for my personal enjoyment and reached the Grandfather Extension Trail junction at 4.4 miles. We took this red-blazed trail, which goes gradually downhill through a series of switchbacks until we reached the parking lot for our car at 5.0 miles. It was a tiring day, but if you are up for an adventurous hike, this is one you should definitely try. 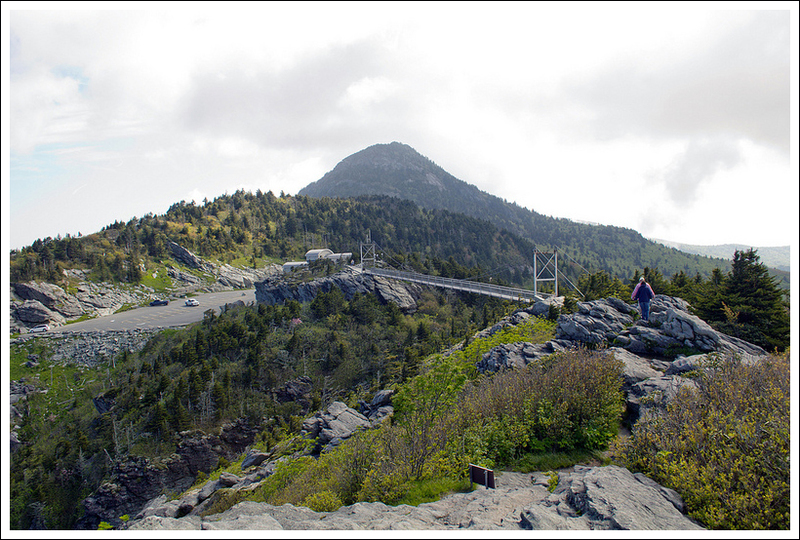 Oh… Grandfather Mountain – what can I say about this place. On one hand, it’s a beautiful, rugged and exciting place to hike. On the other hand, things always seem to go wrong when I hike there – I’m sick, my technology fails, I injure myself. Maybe this mountain is trying to tell me something? Adam enjoys the view from MacRae Peak. 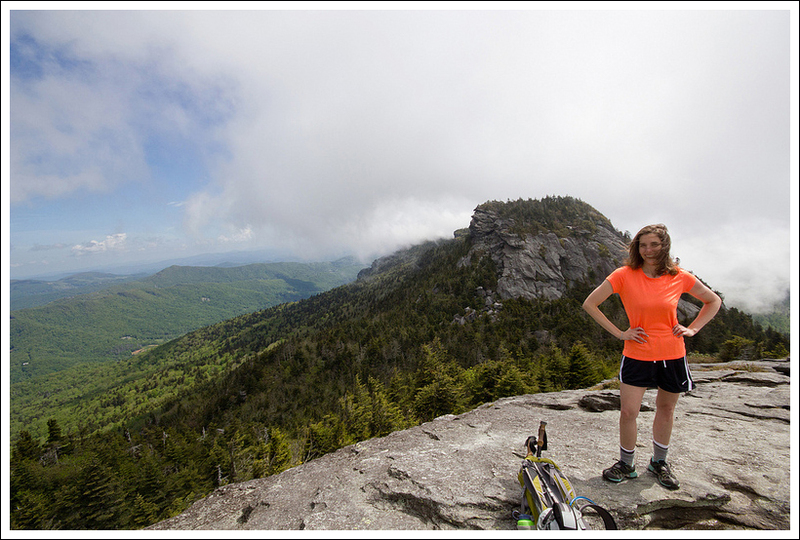 Below; Christine on MacRae Peak; Climbing the rocky trail. The first time we hiked Grandfather, I developed a 101 degree fever, and ended up having to turn around near Attic Window Peak (the original goal had been to make it to Calloway Peak). I was just too dizzy and fatigued to hike anymore. I was really excited to revisit the mountain and finish the hike we tried to do last fall. The morning started off with a great breakfast at the River Dog Café. We paid our entry fee to the park and headed up the mountain. The hiker parking lot was completely empty, skies were sunny and the wind was fairly gentle. It was pretty much the opposite of our last trip up the mountain. We hiked up to the Mile-High Swinging Bridge. This time, we took the time to climb around the rocky outcropping on the far side of the bridge. Back in the fall, the wind had been so strong that we didn’t dare go out on the rocks! 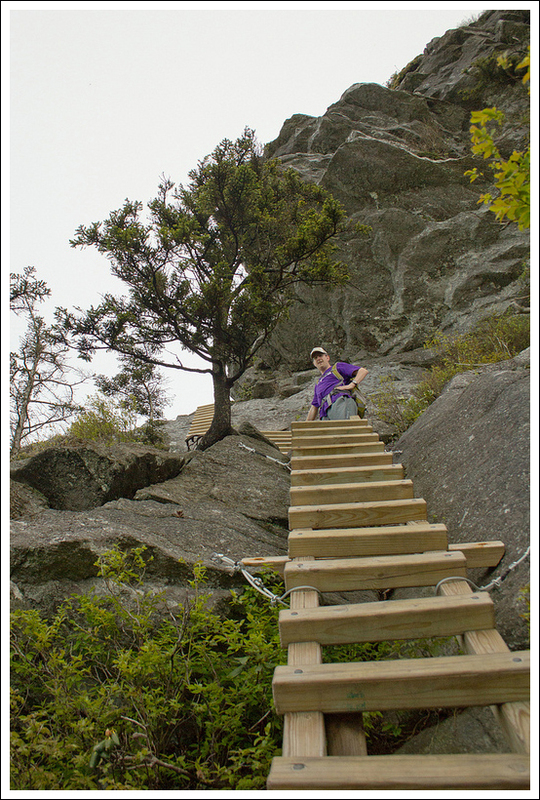 We started up the Grandfather Trail, which departs from the upper parking area. We had the trail mostly to ourselves this time. We really didn’t see anyone else at all until the latter part of the hike. 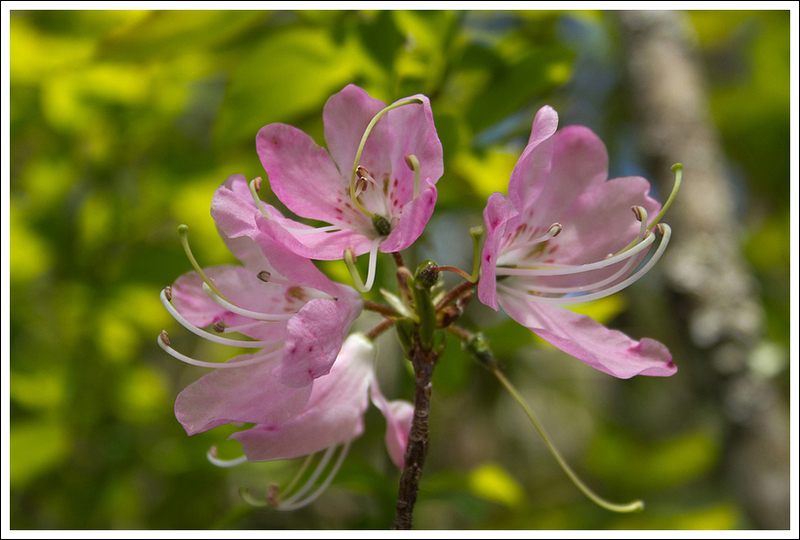 I enjoyed seeing the wild pink azaleas in bloom. Grandfather Gap was especially colorful with blossoms. We negotiated the cables and ladders before coming to MacRae Peak. We scaled the ladder to the top and enjoyed the view from the big rock. One side of the mountain was clear, but the other was covered with low clouds and fog. The breeze pushed the clouds against the side of the mountain. They would hang along the ridge for a few minutes and then roll over and dissipate on the clearer side of the mountain. It was fun to watch the low clouds moving so quickly. Adam crawls through the Subway. 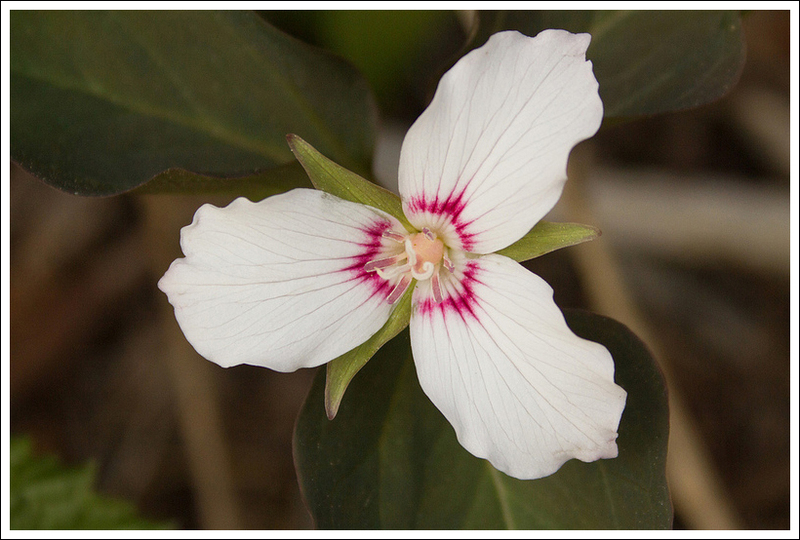 Below: Climbing up the Chute; Beautiful sand myrtle; Painted trillium along the trail. From MacRae, we descended steeply through a slick and rocky gap. The descent was short and ended at an immense rock jumble called ‘The Subway’. 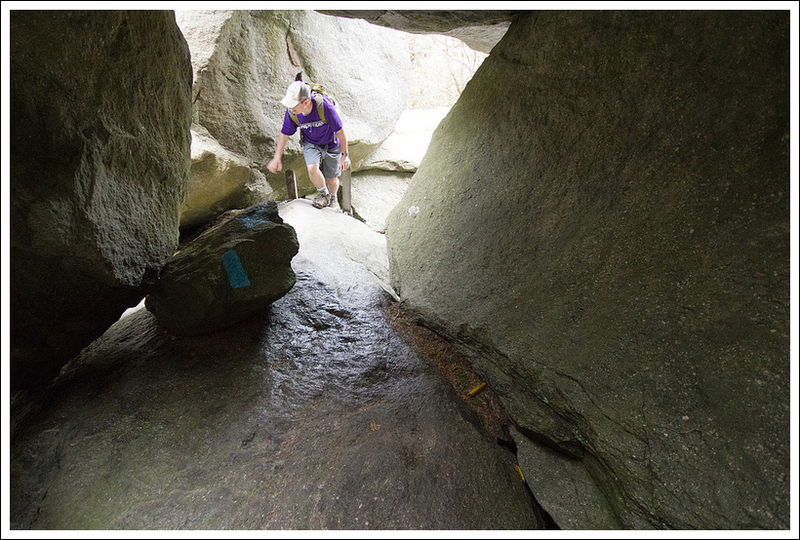 Ladders and blazes lead you through openings between giant boulders. On the other side, you soon face ‘The Chute’. The chute is a narrow, steep rock scramble that you must negotiate to reach Attic Window Peak. From Attic Window Peak, the hike offers some more moderate ridge walking with spectacular views all along the way. The rocky spine was covered with blooming sand myrtle, so it was especially pretty on this visit. In fact, when famed naturalist John Muir visited this mountain, he described this ridge as “the face of all Heaven come to earth.” Luckily, John Muir got to visit this area before some idiot approved the Sugar Mountain construction project. I swear, ‘The Sugar Cube‘ (the main building’s nickname) has to be one of the worst eyesores in Appalachian nature. I guess its construction did inspire a change in legislation, so mistakes like that are less likely to happen again. From the crest of the mountain, the trail descends again before beginning the final ascent toward Calloway Peak. The uphill hike passes through rich, mossy evergreen forest. 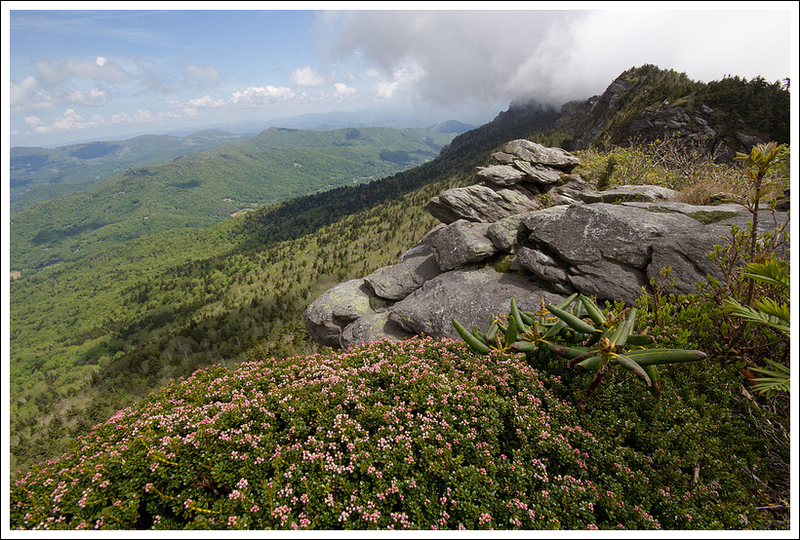 On the way to Calloway, don’t miss taking a few minutes to walk out to the Watauga View. It’s a lovely rocky outcropping that looks into the Watuaga Valley. It was also the last place we had a view on our hike! On the way to Calloway, a massive cloud bank moved in and parked atop the mountain. It was like it was stuck and couldn’t quite make it over the peak. Watauga View was also the place I noticed that my smart phone had crashed at some point and wouldn’t restart (sorry – no MapMyHike stats). Normally, this would be a small annoyance, but just the night before my MacBook Pro self-destructed. Such technology angst! We finished the climb to Calloway (which required a couple more ladders), spotted the elevation benchmark and wondered what the view would have been like on a clear day. Had we continued hiking, we would have continued on the Daniel Boone Trail and soon reached the Hi-Balsam backcountry shelter. But the peak was our turnaround point. When the Underwood Trail ended near Grandfather Gap, I was thrilled to be back on easier footing. The rest of the hike went by quickly and easily. After we got back to our car, we spent some time walking around the Nature Center. We saw bears, eagles and mountain lions and enjoyed eating giant cookies and icy soda. Like I said at the beginning, I both love and hate this trail. It offers so much in terms of scenery and physical challenge, but it’s a tough hike and I always seem to pay some kind of price for hiking there. Maybe I’ll hike it again someday… maybe. The Dreaded Underwood Trail. Below: Grandfather Gap; Almost back to the hiker parking area. Difficulty – 5. Having to use cables and climb ladders should tell you something. While this route was only five miles, you will go very slowly during most of the hike due to the steepness of the terrain. Trail Conditions – 4. 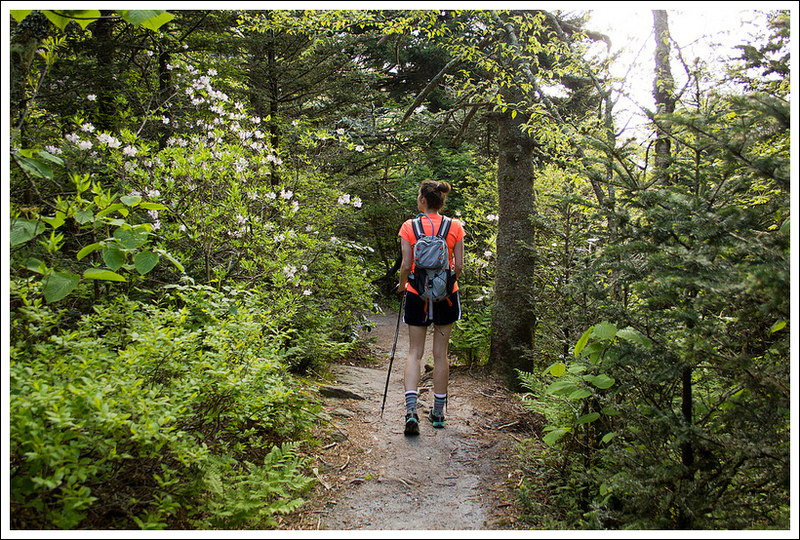 The trail is well-maintained, but that doesn’t make it easy. There are lots of rocky parts to navigate, especially on The Chute up Attic Window and the footing on the Underwood Trail is grueling. Views – 5. 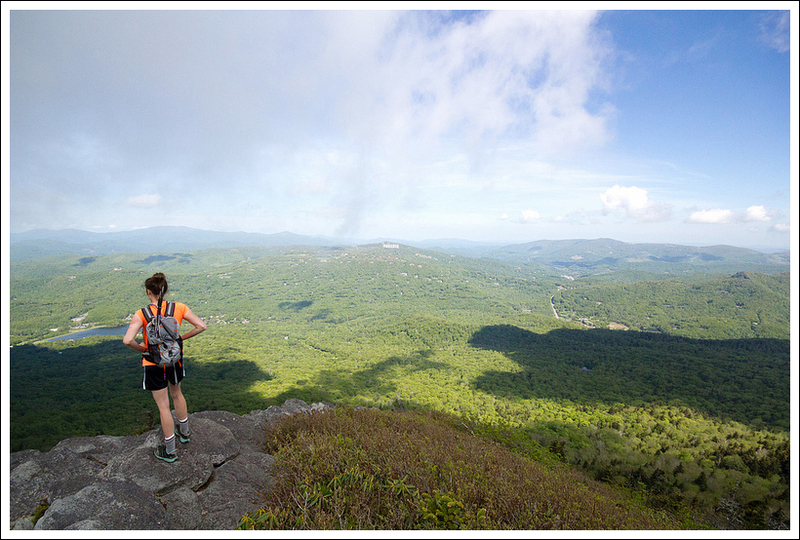 The best views are from the Mile High Swinging Bridge, MacRae Peak, and Attic Window Peak. The clouds were covering the area at Calloway Peak for us, but I could tell the views from the Watauga View would have been spectacular also. Ease to Navigate – 4. All junctions are labeled and the trail is fairly easy to follow. We have seen people get turned around at certain points (including us previously). Solitude – 1.5. I would expect to see people along the trail and lingering especially at the viewpoints. Starting out early in the day should help with the solitude. 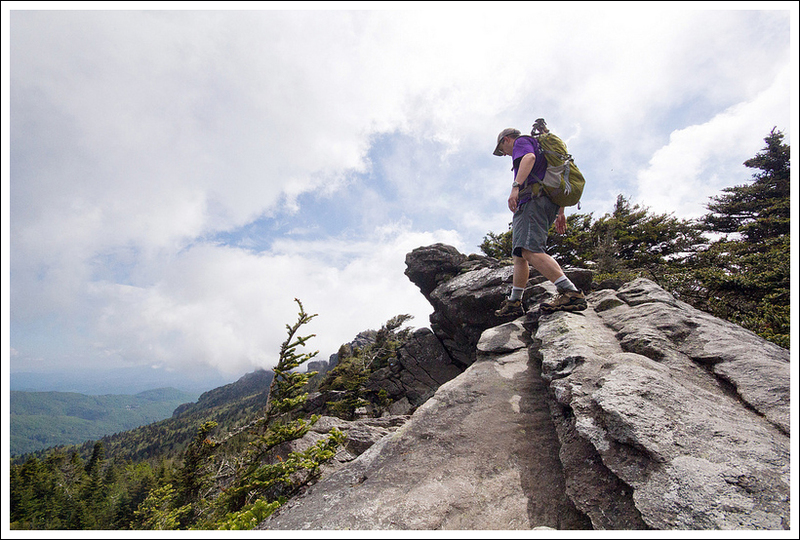 Directions to trailhead: The entrance to Grandfather Mountain is located on US 221, two miles north of Linville, North Carolina, and one mile south of the Blue Ridge Parkway at milepost 305. Signs for the entrance are well-marked and an entrance station is right off the road with large gates. 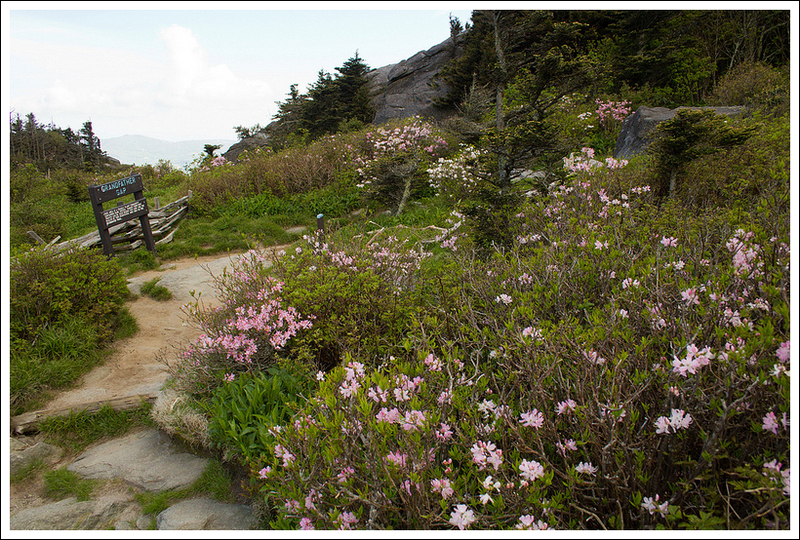 Travel up the road by car until you reach the parking lot designated for hiking trails. The trailhead for the Bridge Trail is on the left side of the parking lot as you are driving up. Coordinates for the hiker parking area are 36.096145, -81.831802. The best way to do Calloway Peak is start at the Scout Trail trailhead on the parkway and go up from there (all the way to the Swinging Bridge if you like). There is no fee this way. It is hard, but doable. I’ve heard that’s a tough climb!